For the first time in many years, I am growing indoors like many of you reading this column. If you read this column regularly you may remember that my orchid collection and I are moving to Jacksonville, Florida. In the interim, many of my orchids are not in a greenhouse, but growing on windowsills and under lights until the new greenhouse is up. Even Florida has days where the air is far too dry for orchids. My first challenge has been to get and keep the humidity high enough under my lights. Fortunately, a neighbor was discarding some old carpet padding, the type that goes below most carpet. This padding is an ideal way to hold moisture if it is the type that is totally synthetic. Cut the padding to fit in your growing area and then set your orchids on the pads. It is not necessary to soak the pad as the pad will become moist if you set pots that were just watered on them. The weight of the pot will make a depression that will retain some water too. When the home heating system is running, mist indoor orchids with de-ionized water, rainwater, or distilled water. Rarely will bacteria and fungi grow on leaves with few nutrients or sugars and these waters have virtually nothing in them. Under lights, the water evaporates quickly and since it is pure water it will not leave unsightly spots. Using tap water, which usually contains some level of dissolved salts, can stain leaves and flowers. One dose of minerals on leaves is not really significant, but if this occurs each day when you mist, minerals can build up to the point where they are not only unsightly, but block light from reaching the leaves. Some of my orchids have also been consigned outside under the eaves because they are too large. In this location they receive low light most of the day and bright sun for 3-4 hours every afternoon. Laelia anceps is the one species that remains outside unless there is a heavy frost warning. Many times growers in California have told me that they got the best blooms on L anceps when they had seen frost on the ground near their L anceps, which they grew outside. Without a doubt, these are the best flowers ever for my L anceps this year. 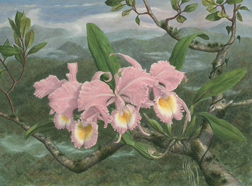 Most cattleya species and hybrids, however, do not like night temperatures below 55 degrees F, but many will get by without any damage if day temperatures rise quickly and the plant is not wet at night. Buds and flowers are more sensitive to these low temperatures and will drop off. A quick check of orchid books devoted to species will provide some idea of the natural conditions and are an excellent way to determine which orchid groups, species and hybrids can best tolerate low temperatures. A few folks in my neighborhood are retired and grow orchids and other Tropicals on carts. They wheel them outside each morning from their garage after the sun has warmed the air to some minimum temperature. While these folks are not true indoor growers, they are growing orchids successfully without a greenhouse. My Jewel Orchids have really enjoyed being inside. They reside in a bathroom window box facing north. They get very little direct light, but are thriving in this location. Remember that the term “Jewel Orchid” refers to a diverse group of unrelated orchids, mostly terrestrial, which have beautiful leaves. A few have colorful flowers, but most do not. Because they naturally grow on the forest floor, they are extremely tolerant of low light levels. Next month there will be more on indoor growing as well as on some of the new products featured at the World Orchid Congress.